daily life and often fascinating lifestyles of people in France. First priority was un double express et un croissant aux amandes. Next came the reading of the newspaper, not just one, but three: the International Herald Tribune, The International Edition of the Wall Street Journal, and Le Figaro. For survival at a dinner party or social conversation, it is imperative to be on top of the news both in France and in the US. I had a lot to learn. Having moved from New York City, I'd taken up the habit of eating breakfast out. It seemed the perfect way to connect with the still somewhat sleepy world, to see people, to be alone, but not lonely. I could ease into my work as the caffeine did its job. I wrote my first book, Paintbrush in Paris, sitting in Ladurée. I went daily for nearly 14 years. 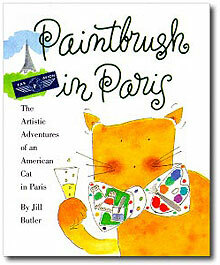 Paintbrush was my American cat that immigrated with me. He was my English-speaking friend and voice in telling our story of moving to Paris through this first illustrated book. The day came, a year and half later, when the first copies of Paintbrush in Paris arrived. I held my breath and slowly let it out as I read it through. It wasn't embarrassing! The next morning, I tucked a copy into my bag and headed out for breakfast. I shared it with Anick, my usual serveuse, and she shared it with the manager, Monique. By a convergence of the stars, the new owners of Ladurée, Francis Holder, and his son, David, were sitting next to me at one of those miniature tables ~ meaning we were practically sitting elbow to elbow. So, Paintbrush in Paris was again shared by Monique, but this time with the Holders. Mr.Holder Senior ** turned to me and said, “Charmant, Madame, bravo!” He asked me who I was, what I was doing in Paris and suggested I should illustrate something for the salon. Heart pounding, I spontaneously proposed a series of postcards that could be sold to other Ladurée and postcard enthusiasts like myself. He took to the idea and immediately passed me and the idea to his son, David, with whom I negotiated our agreement. I was then introduced to their design and interiors director. With the details of our project concluded, it was time to begin. I love to draw food but this felt like an exam. Being a self-taught artist, I hoped I would pass the test. On Monday morning, I was "installed" upstairs in the newly renovated, smoke-free dining room and for three intense mornings silver trays filled with “samples” of every patisserie, Viennoisserie, et dessert was placed before me ~ to draw! After making preliminary sketches, I choose to work with two illustrative styles: one a cut paper style (the façade and coffees ) and the second a more classic pen and ink watercolor style (the map, macaroons, Viennoisseries and pastries) as well as a mix of both (the salon interior). Things like capturing the whipped cream or the layers of a mille feuilles were tricky as were les macarons, Ladurée’s signature product. 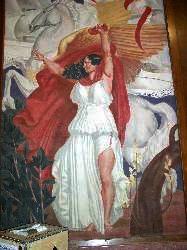 The cherubs painted on the ceiling of the ground floor room alone are worth the visit. If you look closely you can see they are baking the bread by the rays of the sun. I choose to use the cherubs throughout the series of six cards. They also appear in the Ladurée logo. Eventually, every drawing was checked by the design director for accuracy and the text was bien regardé for spelling errors and inaccuracies. The last look was with David and the printer, and off to press it went. I smiled when I saw customers discovering the cards as they paid à la caisse. The enthusiastic mid-westerner that I am wanted to jump up and introduce myself ~ but I contained myself with being happy that they were being purchased. For sure now, I knew that café sitting was ~ if not a full-time job ~ it was a job! As a final note, what I learned was to go ahead and speak up in my less than perfect French, to enjoy the moment, to be slightly outrageous by French standards and to go ahead and put forth an idea when given the opportunity because who knows who's sitting next to you waiting to respond in the positive? Notre Dame Cathedral. Years later, I found my myself living next to Notre Dame on the rue du Clôitre. Notre Dame and the bells awakened me daily. Fourteen years of living in Paris and Normandy have given me an abundance of experience and design inspiration for The Jill Butler Collection of travel guides, dinnerware and tabletop accessories." 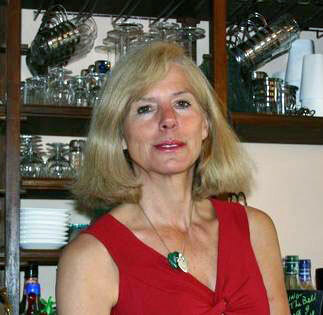 You can reach Jill by email at jillbutler@jillbutler.com or visit her lively web site at http://www.jillbutler.com. I first fell in love with France in the late 70s when I went work as a model in Paris. But, being slightly too short to make the « big bucks », I returned to New York and found a very nice career for myself in advertising. However, I remained in love with France, and in the fall of 1988 I arrived in Paris to, you guessed it, marry a Frenchman. At the age of 36 not only didn't I know one word of French, but I barely knew how to use a microwave! Six months of Alliance Française and a few cookbooks later, I felt I was well on my way. 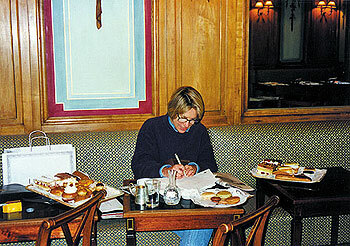 In 1990 I opened Tea and Tattered Pages, a used English bookstore and tearoom which, in spite of its small size, became internationally known for the reasonably priced books and the charm and ambiance of a bookstore offering the first of what became the fashionable combination of serving « comfort food » and tea in a bookstore. Borders and the rest came after! My press book attests to the store's success with appearances on Telematin, Paris Premiere, and Jimmy. 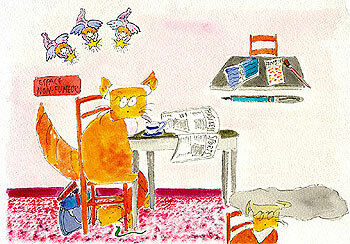 Articles about Tea and Tattered Pages appeared as far away as Iceland! 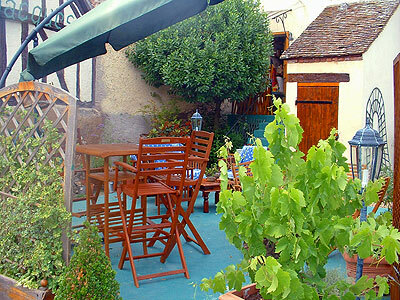 In 1998, my husband and I divorced and, having stayed in love with France, I sold my Parisian bookstore and bought a delapidated auberge in the tiny but charming Solognot village of Ligny le Ribault. After five long years to completely renovate Auberge Saint Jacques, it has become une maison d’hôtes where themed weekends focusing on falconry, cooking, or biking are becoming well known. But, all that was not enough for me. 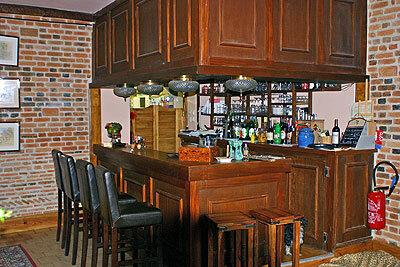 I have turned the orignal bar into what can be compared to as an English club and named it Le Coin Perdu. I have found various artists to exhibit their works there, and one never knows what one will find: watercolors of a sublime Sologne, charatictures of European soldiers, or modern oil paintings. Each exposition changes the ambiance of the « club ». A new addition to the Auberge Saint Jacques are themed dinners once a month. 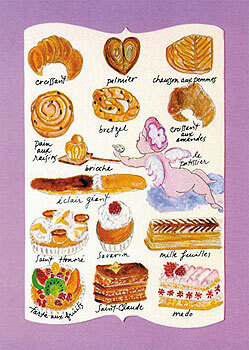 Past dinners have included Thanksgiving, Russian New Year and Saint Valentines. Each menu and history is well reseached so that when a guest leaves, he or she is not only extremely well fed but more informed as well! My cooking classes are also just as diverse ~ Indian, Chinese, Tex-mex, as well as foie gras, and even a "gôuter en anglais" for children from 7-12. It is well worth a weekend trip to enjoy the beautiful sights of Sologne, and I promise to welcome you with warmth and good humor to my little village and Auberge Saint-Jacques! village of Ligny le Ribault just south of the Loiret département capital of Orléans. Her theme weekends, cozy guest rooms and dynamic art exhibits will entice you to stay! or to contact her, send an email to kristi.anderson@orange.fr. Think about it. Most of us who have been to Paris more than once or twice are past the Eiffel Tower-Notre Dame-Louvre tourist circuit. Not that I don’t relish one more trip to the Louvre and the Musée d’ Orsay each time I go, but, in my passion for Paris, after the first few visits I wanted to know more about this beguiling city. That hunger drove me beyond the city center and the tourist tracks that Fodor’s and Rick Steves have ensured are familiar and fully known. What dedicated Francophile isn’t already familiar with the rue Cler in the 7th arrondissement, or the rue Mouffetard in the 5th? I wanted something more, something different. In looking for that something different, I found the edges of Paris and the edgy delights she yields up only to those who seek to know her in all her depths. Paris’ eastern edge draws far fewer visitors than the more celebrated west. It was years of visiting the city before I ventured into exploring the formerly artisan and working class 12th arrondissement -- the very heart of radical and revolutionary Paris. This seldom-explored district offers a great deal beyond the now popular and trendy Bastille area. You have to push eastwards, even past the périphérique, to the very edge of the Bois de Vincennes to find one of the city's fascinating corners and the Palais de Porte d’Orée. The former Museum of African and Oceanic Arts, this extraordinary building is now the official headquarters of France’s architectural patrimony and in its own design a unique architectural treasure. It was built to celebrate France’s pride in her colonies -- it proclaims in a post-colonial world -- and now, in an embarrassing sort of way, France’s civilizing imperial mission. Erected in 1931 for the World’s Fair, it shouts France’s pride in her colonies and her success in shouldering the white man’s burden. Politics aside, the medium’s message here should not keep anyone from admiring an art-deco artistic masterpiece. Walking from the Porte d'Orée métro exit, the visitor approaches the building past a towering golden figure of Civilizing Marianne, her image glittering in the reflecting pool, lined with palm trees, stretching at her feet. The palms are the first note of a colonial song that rings more loudly as the building, covered with monumental carvings, rises into view. The square columns surrounding the square building pull the visitor around complex images of ships, tropical trees and flowers, native populations in exotic dress, elephants and other fauna alien to France but not to her colonies amid a roll call of the names of the colonies. Along the western side, shadowed at times by the filtered light of the trees, is a list of the names of the architects of France’s empire. Colbert is there, de Lesseps is there — even Iberville and Bienville, the “organizers of Louisiana.” All of France’s colonies are there, even the least important. 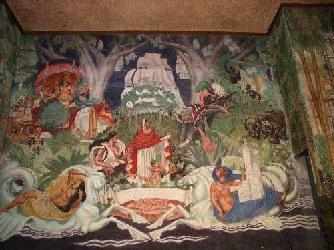 Inside, in the vast central hall, colorful frescoes in the style of the muralists of the 1930s continue the celebratory song. 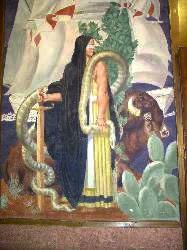 The room is beautiful and the frescoes do as they were intended to do — inspire awe. A towering figure of blind Justice, French justice clearly, stands in Michaelangelo-esque majesty in one niche, while above the entrance door a flotilla of sailing ships carries French benefits to all the corners of the world. To complete the introduction to the wonders that colonial exploration brought to the homeland, the basement aquarium shelters the only alligators to be found in the city along with illuminated windows of colorful tropical fish that glow eerily in the darkened corridors. 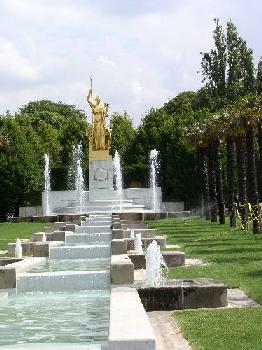 Not far away, near the Paris zoo and the Lac Daumesnil, is the Buddhist temple. This trip to the edge of the city is a visit beyond the borders of France -- even beyond the borders of the Francophone world. Marianne, holding high her torch of civilization and light, lingers in the mind’s eye. To know Paris in all the facets of her richness, a visit to the Palais de Porte D’Orée is de rigueur. It is more than a visit to a monument — it is a visit to the edges of the French experience, to the world and mind of the early twentieth century, to the iconography of the 1930s, to a time when western culture was seen to shine like Marianne’s torch. And it will introduce you to the fascinating edges of a city in a constant process of self-transformation. So don’t stay in the center — go to the edge. Helen Vaughan Simpson worked and lived part-time in Paris from the mid-1980s until recently. She is passionate about Paris’ history, artistic heritage, and past personalities. Burgundy on a Plate, my wine and gastronomy tour company based in Burgundy, is the eventual flowering of a seed planted long ago while I was working on floating hotels on Burgundy’s inland waterway network. Working as a chef in the region had been a revelation to me. I delighted purchasing my ingredients from the wonderful outdoor markets ~ a riot of colorful fruits, vegetables and flowers ~ and I was astonished by the sheer variety of cheeses and the quality of the meat and fish. In addition, the wonderful vineyards where we would take our passengers for tastings were the icing on the cake. I developed a real passion for the region, and I vowed that one day I would return to create my own business. However, ‘life is what happens while planning other things’ as they say ~ and one day I woke up in London and realized that my long-held dream was looking unlikely to be fulfilled. It suddenly came to me that not pursuing my dream was going to be far more painful in the long run than simply throwing myself into action and going for it! So after a period of research and several visits to Burgundy, I set a date for departure. My first step was to actually get to France, which I did by crossing the English Channel in my Dutch ex-sailing barge. With the help of friends, I navigated for three long weeks through the waterway network going through, what seemed at the time, hundreds of locks to get to St Jean de Losne in Burgundy where there was a mooring awaiting me. In France there are not that many suitable employment opportunities for foreigners, so I knew I had to get straight in there and get my business up and running. I was confident that I had the skills necessary to offer a truly special experience for my clients, and my nine years working for Eurotunnel had honed my business and language skills, both essential in my future undertakings. Now, I’m delighted to say that my company Burgundy on a Plate offers a taste of the real Burgundy, as it’s experienced by the people who live here. 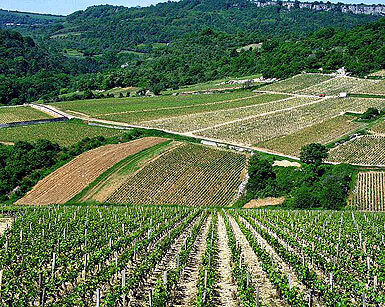 The pride in its cuisine, the magnificence of its vines and wines and the quality and variety of its produce makes Burgundy a perfect region for a wine and gastronomy discovery tour. These private, guided tours will bring participants a deeper knowledge and understanding of the history, wine, and gastronomy of this region, enabling them to meet wine producers in family-owned vineyards, to taste artisanal local specialities in some remote locations, and to dine in some unusual restaurants, such as a ferme auberge run by local farmers' wives or a restaurant in a wine cellar. 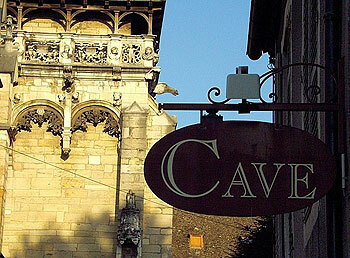 In addition to our week-long tours, there are eight one-day themed tours to choose from ~from wine and cheese to Cassis, Cooking, and Côte de Nuits ~ for those people with limited time in the area. We also offer custom-made tours, and whether one's interests lie in wine, gastronomy, history, art, architecture, golf or cooking, we can design and create a tour especially for those interests. At last I am doing something in my life that I love, and I hope that some of this love of Burgundy rubs off on my clients. Judging by their reactions ~ it’s working!